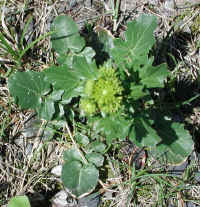 (Winter Cress, Early (Barbarea verna) - 01) Early winter cress is one of the early spring wildflowers, but it is only in its bud stage when the dandelions begin to bloom, as can be seen in this photo (right side). 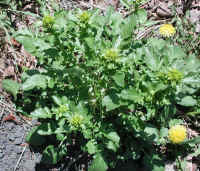 Early winter cress is a member of the mustard family, Brassicaceae, and closely resembles common winter cress, B. vulgaris. (Winter Cress, Early (Barbarea verna) - 02) The only differences we could find to identify the early winter cress are the larger number of lateral lobes (4 or more) in the lower leaves, and the seed pods are sharply 4-sided. (Winter Cress, Early (Barbarea verna) - 02a) This is a closer look at an early winter cress. 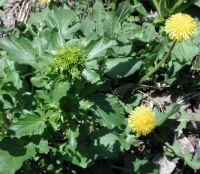 Note that there are at least 4 pairs of lateral lobes on the leaf on the right side of the photo. (Winter Cress, Early (Barbarea verna) - 03) In this photo we have a closer look at the developing flower buds and upper leaves of the early winter cress, which differ considerably from the lower leaves. 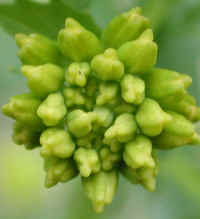 (Winter Cress, Early (Barbarea verna) - 04) This is a closer look at a terminal cluster of flower buds on an early winter cress. (Winter Cress, Early (Barbarea verna) - 05) This early winter cress was growing by itself just off the shoulder of the road. 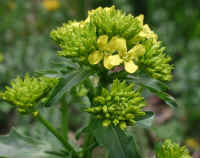 At this stage of growth, before the flowers open, the leaves of the early winter cress can be eaten in salads and as cooked greens, but be very careful that they are not common wintercress, which has been reported to cause kidney problems. 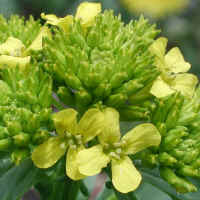 In certain places, particularly in Europe, winter cress varieties have been cultivated for this purpose. 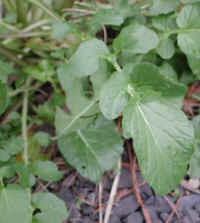 (Winter Cress, Early (Barbarea verna) - 06) This is another look at an early winter cress. (Winter Cress, Early (Barbarea verna) - 07) This photo gives us a closer look at the developing early winter cress flower buds and the deeply notched ends of the upper leaves. 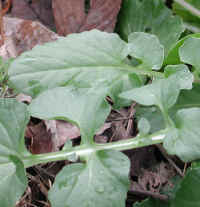 Comparing these leaves to the lower leaves with their rounded ends can help in the identification of both the early and common species of winter cress. 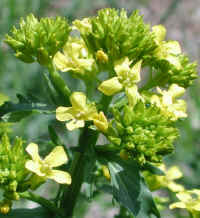 There are only three known species of winter cress in the United States. (Winter Cress, Early (Barbarea verna) - 08) This is a partial side view of a small patch of maturing early winter cress. 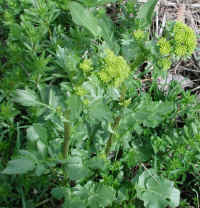 (Winter Cress, Early (Barbarea verna) - 08a) Note that the lower leaves of the early winter cress have at least four pairs of lobes below the terminal lobe, and that the leaves growing higher on the plant have fewer lobes. 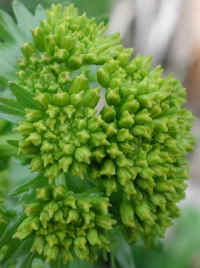 (Winter Cress, Early (Barbarea verna) - 09) This is another close up look at the developing flower buds of the early winter cress. 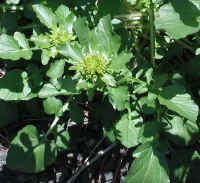 (Winter Cress, Early (Barbarea verna) - 10) The budded raceme on this early winter cress is beginning to separate into its various flower clusters. (Winter Cress, Early (Barbarea verna) - 11) The individual budded flower clusters are more widely separated on this early winter cress. (Winter Cress, Early (Barbarea verna) - 12) In this photo of the early winter cress we can see the ribbed stem and the flower bud clusters growing from the leaf axils. 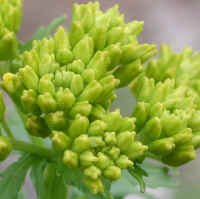 (Winter Cress, Early (Barbarea verna) - 13) This is a close-up of an individual bud cluster on an early winter cress. 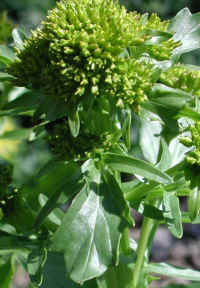 (Winter Cress, Early (Barbarea verna) - 14) This is another look at the bud clusters of an early winter cress. 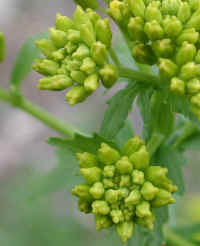 (Winter Cress, Early (Barbarea verna) - 15) In this side view of the upper flower cluster of the early winter cress, we can see that each bud has its own stem. 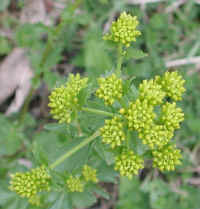 (Winter Cress, Early (Barbarea verna) - 15a) A few of the buds on this early winter cress are just beginning to open. (Winter Cress, Early (Barbarea verna) - 16) Most of the literature we've look at seems to imply that the leaves of the early winter cress will be fairly much the same. We have not found this to be true. 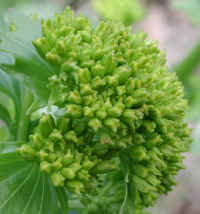 Sometimes the lobes are very small, other times they are not in pairs, and usually the number of lobes vary from leaf to leaf. 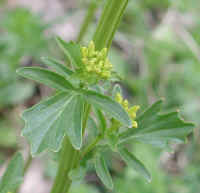 Since the lower leaves of the common winter cress usually have only one or two pairs of lateral lobes, the presence of four or more lateral lobes distinguishes the early winter cress. 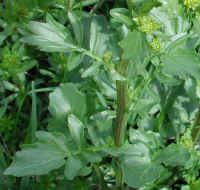 (Winter Cress, Early (Barbarea verna) - 17) This is an example of how some of the lateral lobes of the early winter cress can vary in size. 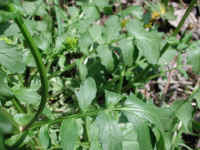 In this close up photo of the previous image, note the small lateral lobes (on the lower leaf), which occur between the terminal lobe and the second lateral lobes and between the second and fourth lateral lobes. 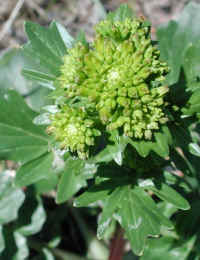 There is also a fifth pair of lateral lobes to the right of this photo (see the previous photo). (Winter Cress, Early (Barbarea verna) - 18) This is another example of how the lateral lobes on the lower leaves of the early winter cress differ in size and shape. (Winter Cress, Early (Barbarea verna) - 19) As we look farther up the stem of the early winter cress, we see the terminal lobes of the leaves becoming elongated with more notching, and the lateral lobes becoming narrow. 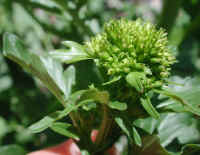 Near the terminal flowers, the lateral lobes disappear and the remaining terminal lobes are either narrow, like the lateral lobes on the leaf below, or broad with deep notching. 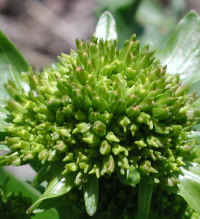 (Winter Cress, Early (Barbarea verna) - 20) This is another close up look at an early winter cress in its bud stage. 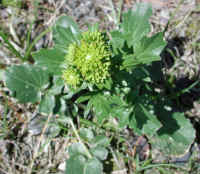 (Winter Cress, Early (Barbarea verna) - 21) The flowers on this early winter cress have begun to open. Each flower has 4 petals, 6 stamens, and 1 pistil. 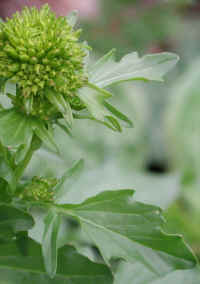 On the right side of this photo, we can also see the trumpet shape of the early winter cress flowers as shown in the side view of a flower. 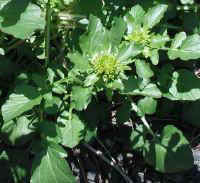 (Winter Cress, Early (Barbarea verna) - 22) This is another look at the early winter cress as it begins to flower. 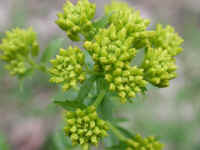 (Winter Cress, Early (Barbarea verna) - 23) This is another close up photo of an early winter cress that has begun to flower. (Winter Cress, Early (Barbarea verna) - 24) This is another look at the leaves of the early winter cress.